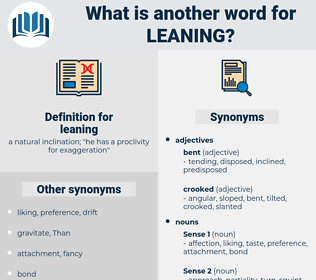 What is another word for leaning? a natural inclination; " he has a proclivity for exaggeration"
learning, Concentrating, elearning, Endorsing, reclining, Examining, Exploring, Considering, Addressing, pressurising, support, supporting, wondering, bending, Seconding, Relying, catering, reflecting, pressuring, calling, tending, Referring, dealing, Aiming, searching, Quoting, reviewing, Attempting, according, Requiring, folding, Purporting, looking, turning, Lobbying, heading, Dipping, focusing, focussing, studying, backing. capitalizes, expands, embraces, adheres, utilizes, depends, hinges, relies, builds, Focuses, draws, Rests. parallel, vertical, plumb, perpendicular, level. A man was on it, leaning over his shoulder. I believe they are to pass by here on their way to Washington, remarked Berkley, opening the window and leaning out. 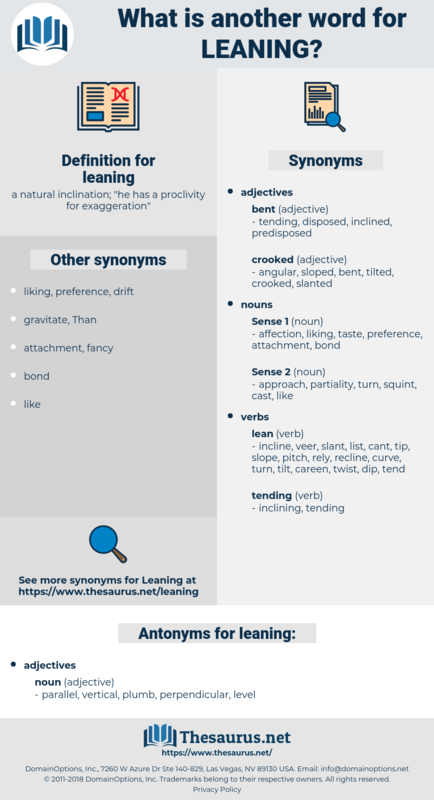 lemon cheese, lioness, linux, line coach, lance, leniency, Ling Ko, lemnaceae, lank, lanugo, lineage, lenience, Lamna Nasus, leuwenhoek, lanchow, leanness, lulling, lallans, lionize, long, limnos, lemmus, lunge, lounge, luminance, lingua, lange, linnaeus, lilongwe, Lowliness, loins, linkage, lansa, language, longways, linac, lyons, lying, lummox, low mass, lanzhou, linz, lyonnais, linage, lung, lowness, lonas, long-ago, limosa, Lynx, lunacy, longwise, lime juice, longish, lining, long ago, luminous, link, lingo, lemniscus, lennoaceae, laying, low-lying, ling, lungi, loyang, lense, luminesce, lanky, longyi, Lillian Gish, lameness, lionise, lemon juice, lungyi, lynch, lunch, lanius, luoyang, lemnos, launch, lens, lanseh, linguica, liomys, loaning, lion monkey, leymus, limning, lammas, leeuwenhoek, links, launce, limax, Lamiaceae, lanchou, lamaze, languish, linaceae, Lyonnaise Sauce, lyonnaise, lemming.